What is a MARK layer attachment/metadata? The mark-up attachment allows the user, tools and even external plug-ins to add data to a layer in a simple plain-text (UTF-8) format. The data may then be used for whatever purpose. All elements take the form object.property=value; where property may have sub-properties within it. The data may be edited within the mark-up editor dialog and may be broadcast to other layers. Some implementations may be case-sensitive; it is therefore advised that you observe case. Common uses for the MARK attachment include adding hotspot and color depth information to images, and capsulating EXIF camera metadata. MARK may also be used for format-specific data, subject to namespace rules. image. Reserved namespace for image-data-specific attributes. image.bpp=x; This tag is used to define the target color depth, x, in bits per pixel. It is used by the file plug-ins for icons, cursors and BMP images. image.dpi=x,y; Deprecated; use image.ppi instead. image.ppi=x,y; This tag sets the pixel density for the image (x,y) in pixels per inch (PPI). It is used to calculate the physical/printing size of the image. image.ppcm=x,y; Reserved; unused metric equivalent of image.ppi (ppcm is pixels per centimeter). image.ppm=x,y; Reserved; unused metric equivalent of image.ppi (ppm is pixels per meter). image.hotspot=x,y; This tag sets a hot-spot at the location (x,y). It is used by the mark-up tool and icon/cursor plug-in. exif. 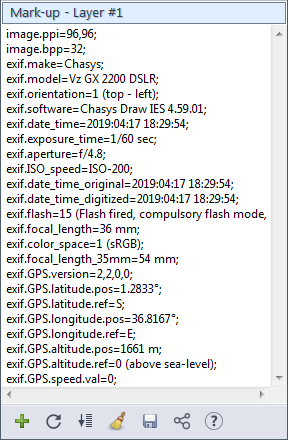 Reserved namespace for EXIF data attributes. It is used by rawPhoto and the JPEG plug-in. brush. Reserved namespace for brush object attributes. brush.spacing=x; This tag is used to control the spacing attribute of a custom brush. brush.color_mode=mode; This tag is used to define the color mode of a custom brush. Three modes are supported, color, alpha and mono. brush.scale_mode=mode; This tag is used to define the scaling mode of a custom brush. Two modes are supported, smooth and rough. brush.auto_select=mode; This tag is used to define the auto-selection mode of a custom brush. Two modes are supported, none and width. brush.auto_rotate=mode; This tag is used to define the auto-rotation mode of a custom brush. Three modes are supported, none, vector and user_input. anim. Reserved namespace for animation attributes. anim.group.tag=value; These are reserved for use by future animation extensions. file. Reserved namespace for file-type-specific attributes. system. Reserved namespace for system attributes. core. Reserved namespace for system attributes. The presence of metadata is indicated by a small paperclip next to the layer in the layers window. The number of attachments is indicated below it. Clicking the paperclip brings up the attachment manager.